Dream images are a lot like art images in that both come to us from our unconscious mind to teach, reveal, heal, or process something. Today I'm sharing three easy ways to engage with your nighttime dream world in your waking life. First, if you are a person who has a hard time recalling your dreams once you are awake, it may help to add a peaceful ritual to your bedtime routine, whereby you turn off the lights, light a candle, and set an intention to bring your dreams into waking consciousness the next morning. You might even invoke a dream at night by asking for clarity around an issue in your life. In the morning, set aside about five minutes of quiet (even if this means waking before the rest of your household) to scribble down any notes or doodles about what you remember from the night before. Ultimately dreams symbols are unique to the dreamer. For example, one person may think fire is destructive while another might find fire to be cleansing. Dream decoder books totally run with the idea that one thing equals another, which drives me bonkers because it doesn't empower the dreamer to interpret her or his own dream. In my view, the meaning the dreamer assigns to each symbol in a dream is the most important place to begin the exploration. After the dreamer's associations have been explored, it may then be enlightening to tap into what the collective unconscious views these symbols to mean, to see if it lends any wisdom. For that second phase, I like to look at archetypes, symbols, and cultural associations. Recurring dreams often happen when we still have not addressed the issue being presented, so they come back to us, calling louder and louder for us to pay attention. With recurring dreams, sometimes the story or symbols in the dream can shift, but the emotional intensity, quality, and often the overarching meaning stay the same. 1) Tell the dream to your therapist or a trusted person from start to finish without interruption. Re-experiencing the story in the present moment while it telling can allow you to gain mastery over it and give you a new perspective on it. This can happen with a therapist guiding you to be alert to your body's responses and wisdom during your retelling, and by having a compassionate witness for the process. 2) Express the dream non-verbally through art. You might choose to make a book or cartoon panels about the story or perhaps set up the scene in a sand tray, with the supportive presence of an art therapist. You don't always need to unpack the meaning of each literal dream symbol and bring it into consciousness necessarily; working with the emotional quality of the dream may be quite helpful in itself. 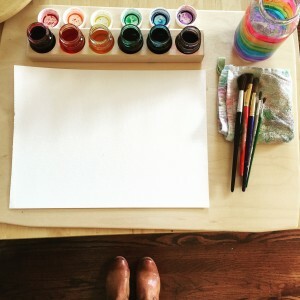 You can bring out "loose" art materials -- meaning ones that are really formless and open -- like watercolors, fingerpaints, or clay -- and trust that what needs to be expressed will be expressed through the art. Loose art media allow the spirit the opportunity to process unconsciously. This involves a degree of just trusting the process since it won't always look like it's directly accessing the dream content or characters. You will likely experience shifts in the dream or your response to the dream as you engage in this process. 3) Take the dream further in your waking life by asking yourself what happens next. You might imagine what you would have needed in the dream in order to solve the obstacle in the dream, if it did not play out in your sleep in a satisfying way -- maybe a tool, a shield, a magic power, a special uniform, or a vehicle, etc. Enjoy creating this item as an art project, as it directly accesses your inner resources and allows you to spend time creating your own solution. You can get creative with ways to further the dream and access all of the things your waking mind has at its disposal. After accessing resources in some way, you can tell the new story with its new ending, either by journaling or retelling it to a trusted person. Wishing you rich, juicy dreams tonight! I am often asked by clients, colleagues, and friends which art supplies are my favorites. I've not met an art supply I don't like, but I do have some standouts that are in heavy rotation in my studio. I believe in presenting my clients (and myself) with quality materials that foster positive, satisfying experiences. I display them in an attractive way, much like setting a buffet table for a most important dinner guest. I prefer natural light, beeswax candles cleanly burning, sometimes diffusing essential oils into the air, and in some cases, playing appropriate music. Creating a safe, pleasing sanctuary is part of the ritual of making art in my healing studio. This is not an exhaustive list of art supplies, by any means. It's just a sampling of a few staples in my personal studio stash. You can click the orange links in the body of this post to find these supplies on Amazon (affiliate links) or on other non-affiliated sites. Sharpies are a go-to art supply for me - I like to Zentangle and make zendalas with Sharpies. I also draw with them and then apply watercolors because these permanent markers will not run. When it comes to colored pencils, I have two favs. For a standard, fine point, you cannot beat good ol' Prismacolors. Sure, they're more spendy than Crayola, but quality over quantity counts so much in art supplies in setting yourself up for a successful, easeful, richly expressive experience. I also love the luscious softness of Ferby Lyra colored pencils. I recently found these woodless colored pencils, and I'm hooked on them. Wet-on-wet watercoloring with liquid watercolors is one the most soothing activities for me personally, and for many of my clients. Mmmmmm! These are my favorite (and inexpensive!) liquid watercolors. I present them ceremoniously in these wonderful jars with these great wooden boards in my studio, and super-soft brushes aplenty. Cake watercolors are old standbys for me, too. I prefer the palettes, vibrancy, and smooth application of these by Loew Cornell. Because I don't have a kiln in my studio (yet? hmm..someday! 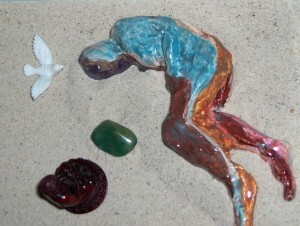 ), I rely on air-dry clay. I'm partial to the terra-cotta colored self-hardening clay. I also like white and gray tones, depending on the project. It's surprisingly strong when it dries, and can be easily painted with acrylics or inks. I'm a fan of washi tapes of all colors and patterns. I stock baskets of yarns, ribbons, silks, cloth scraps... I offer wool roving, beeswax, buttons, and collage materials. I also love to keep natural wooden objects in my studio, such as wooden peg people, eggs, and Matryoshka nesting dolls. I get many of them at Casey Wood, but the basics can often be found on Amazon. Most of all, I love art materials that are freely acquired from our abundant momma earth -- natural materials. I have stashes of sticks, driftwood, shells, stones, acorns, pinecones, feathers, leaves, garlic peels, twigs, moss, etc. that lend themselves to all sorts of art projects. They're free, gorgeous, and allow for such open-ended creating -- easily my favorite part of my studio. You can check out some of my favorite supplies by clicking on the links to them in the text above and in the Amazon box below (scroll thru 5 pages in box) where you'll find extra goodies. Happy creating! You can shop the list of my favorite supplies in my studio here. 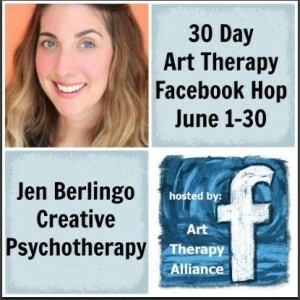 Throughout the month of June, the Art Therapy Alliance is featuring a different art therapist each day in a blog hop. I am so honored to be included among such inspirational healing arts professionals, as today is my day to be highlighted. Please visit the Facebook page for my practice, if you've not already done so, as I post daily inspirations and relevant articles, as well as updates on my offerings. Please do follow along on the "hop" to learn more about 30 different and beautiful expressions of art therapy around the country and world. Let's celebrate this profound healing modality and so many of my awesome colleagues! 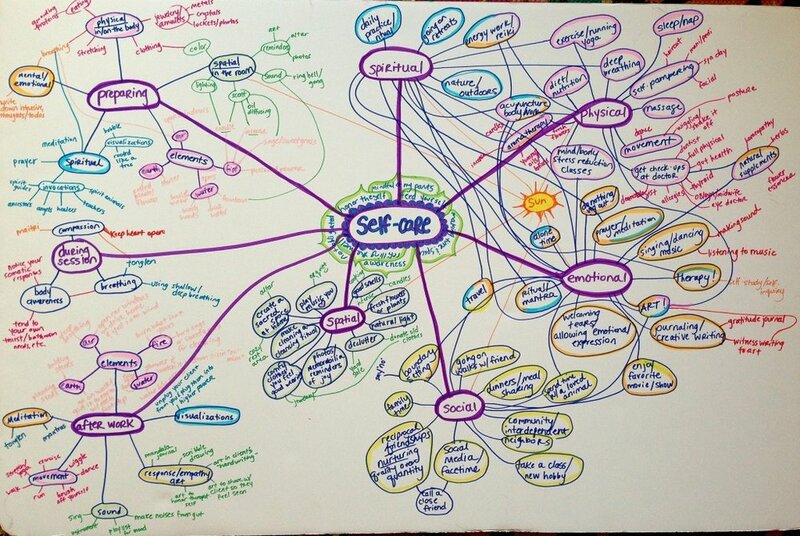 The image above contains collective wisdom about the ways many of us may already be working self-care into our lives, and it also contains ideas that might be new to you for considering how you might refuel and practice gentleness and kindness with yourself. Notes on these can be seen on the left side of the diagram above; however, it is important to create rituals that are personal and unique to you. In my private practice, many of my clients are other therapists, therapy graduate students and interns, healers, and caregivers who wish to create personalized, sustainable ways of making self care part of their daily rituals. If you'd like to connect with me for a free 20-minute consultation to see if I may be able to help you, please contact me. I plan to offer a similar group later this year, most likely in autumn. Stay tuned to find out when by signing up for my e-newsletter (over there in the right column) and by following me on Facebook and/or Twitter.